I’ve always loved barbecue – ribs, sandwiches, chicken legs. Of course, all the sides that usually come with it are delicious too. I grew up on the East Coast and had quite a bit of my share of BBQ with different sauces depending on the culture where you were currently eating. When The Kid and I moved to Texas, I was thrilled to live in a state known for its BBQ. Shortly after we got here we went to a restaurant to give it a try. I remember sitting there and The Kid kept chewing and chewing. Something was weird but I couldn’t put my finger on what was wrong with the BBQ. Then I realized. I’d tried all kinds of sauces from vinegar based to spicy to mustard based, but all those sauces had been on pork BBQ. I was living in beef country now and we were trying beef BBQ for the first time. In honor of summer BBQ season, I made BBQ pork tenderloin last week with a sweet sauce. 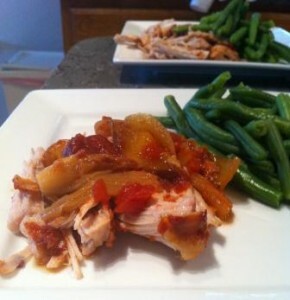 I loved this one since I put the ingredients together in a slow cooker the night before. In the morning before work, I just took it out of the fridge and plugged it in. It was a joyous moment to come home after work to the smell of BBQ and I didn’t have to lift a finger or drive anywhere. It was a huge bonus that it was healthy too. The original recipe can be found in the July 2012 issue of Clean Eating magazine, but I heavily modified it as usual to make it more convenient for me. Their version used a peach and had you making the BBQ sauce on the stove first and pureeing before it even got to the slow cooker. I used a nectarine and just cut and dumped everything in together. I also used double the amount of pork. Even doubled, my version was really saucy so I can’t imagine the amount of sauce if you had only 1 lb of meat! Place your onion, garlic and nectarine into a 3 quart slow cooker. Add the tomatoes, paste, vinegar, syrup, and Worcestershire. Put the two tenderloin pieces in and stir slightly to mix and lightly cover the pork. Put the lid on and cook on low for 8 – 10 hours. The pork will become really tender as it cooks and you can easily shred it to use in wraps, salads, and sandwiches. Serves 8. I did the calorie math on my version of the recipe and each serving of pork and sauce has approximately 185 calories. We ate this one night just shredded with green beans and baked potatoes. I also had leftovers on a salad and tried it in a whole wheat wrap with shredded cabbage. It made so much that I have a batch frozen for easy dinners next week too.